Inspiration for the Blue Jays Positional Primer series comes from Jason Parks of Baseball Prospectus. Over the course of the second half of the season, Jason examined the prospects in the entire minor leagues on a position-by-position basis, giving insight into players both within and well outside the top 100 rankings. While the sample size of one team is vastly inferior to that of the entire minor leagues, I feel Toronto has enough depth in the farm -- particularly in the low minors -- that such a series could provide some insight into prospects that Blue Jays fans aren't as familiar with as they should be. This is the sixth installment of an eight part series that will examine catcher, first base, middle infield, third base, center field, corner outfield, right handed pitcher, and left handed pitcher. The middle infield and corner outfield lists are included as there's really no such thing as a second base or left field prospect, they're just shortstops and center/right fielders who couldn't handle the defensive demands and get moved to the easier defensive position as they age. It should be noted that -- outside of the Leader of the Pack, who is the #1 for the position -- these are not necessarily progressive rankings of the prospects. 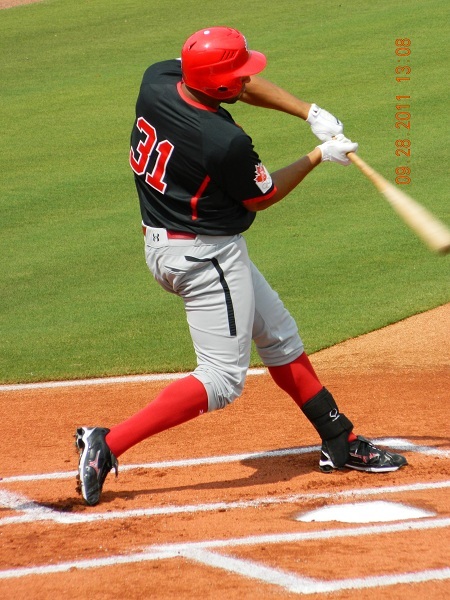 Originally announced as a shortstop in the 2010 draft, Hawkins has since moved to third base and subsequently to the outfield, where he manned left for the Bluefield Blue Jays in 2011. Hawkins was a 3rd round pick for Toronto, and signed early enough to play 46 games for the Gulf Coast Blue Jays in his draft season, a rare thing to see from a highschool player selected early. Hawkins is the first of four Toronto Top 30 prospects to make the corner outfield positional primer. Switching defensive positions early in a career is often a bad sign. Moving twice from shortstop (a high demand defensive position) to third base (a medium demand defensive position) to left field (a low demand defensive position) is even worse. It’s not that Hawkins isn’t athletic; he just lacks the smoothness and grace required for an infield position. 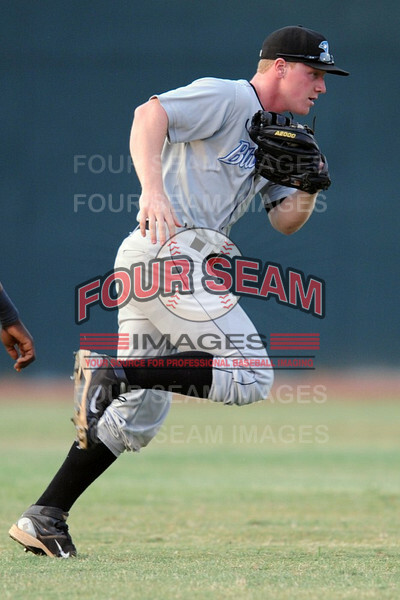 His six triples and 14 stolen bases in 68 games can attest to his above average running ability and athleticism. His power is fringe above average, but his 15 HR ceiling certainly looks more impressive from shortstop than it does in left field. Hawkins best tool, however, is his bat. He has excellent pitch recognition and his strong build (6’2”, 195 lbs) allows him to generate good bat speed, lining balls to all fields. There is still some belief he could play center field due to his borderline plus calibre arm, but with the wealth of centerfielders in Toronto’s system already, Hawkins should be kept in left and allowed to work on the development of his swing. Hawkins killed the Appalachian League as 19/20 year old, and now has two years worth of short season experience under his belt. It’s probably time for Hawkins to make the leap to full season ball with the Lansing Lugnuts, as he is Toronto’s most experienced corner outfielder in the low minors and has the approach/maturity combination to handle any of the ups and downs the Midwest League might throw at him. An international free agent signee in late 2005, Sierra recently completed his sixth season in the Blue Jays organization despite only turning 23 years old in late September. His first four seasons followed a path typical of young Dominican prospects, as he spent two years in short season leagues –- one in the Dominican League, followed by one in the Gulf Coast League. In 2008 he made the leap to full season ball with Single-A Lansing, and in 2009 he established his prospect status, hitting .292/.360/.399 (.759) in 118 games between High-A Dunedin and Double-A New Hampshire -– two leagues that are often difficult to hit in. Sierra’s career got completely sidetracked in 2010, which leads to his status as the corner outfield’s biggest question mark. He played only 20 total games that season due to a couple of very significant injuries. First, he suffered a microfracture in his shin early in the season, forcing him to miss almost three full months. Later, not long after returning, he suffered a broken hamate bone. The hamate is a small bone near the base of the hand that usually takes 4-6 weeks for the bone to heal, but the damage to the player’s power often takes much longer to recover from. Sierra entered 2011 healthy for the first time in years, and took an aggressive assignment in stride, putting together the solid all-around line seen above. 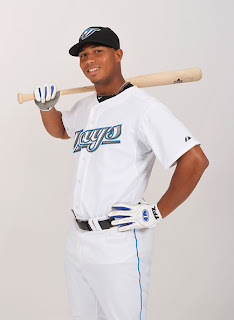 His best tool is his arm, which is easily the best of any of Toronto’s outfield prospects. It’s at least a 70 tool, and has likely received more than a few 80’s from scouts in attendance of his games. His fielding skills in right field are solid, but his arm is so good it would be waste to try him elsewhere. His power took a huge step forward in 2011, as he doubled his previous career high in home runs. At 6’0”, 225 lbs, it’s possible there is potential for further power growth. His bat tool is fringe average-above average, but his much improved plate discipline allows it to play up. He has stolen 10+ bases in four seasons which is indicative of his above average raw speed, but his 14 caught stealing in 2011 suggest he needs some refinement in his base running skills. With a Triple-A Las Vegas assignment in 2012, Sierra could really go off. Born in Toronto, Knecht followed a different path to affiliated ball than most. Knecht was originally drafted out of high school by the Milwaukee Brewers in the 23rd round of the 2008 draft, but instead chose to fulfill his commitment to Oklahoma State. His university of choice did not show him the same commitment, as they gave him only 12 at-bats in his freshman season. Knecht decided to take his talents elsewhere, transferring to nearby Connors State Junior College. The move paid off, as Knecht crushed the ball in a fulltime role, and had scouts throwing draft grades on him as high as the first round. Toronto took a risk waiting until the 113th pick, but got their man in the third round. Knecht is a mediocre fielder with a fringe-average arm, making his best-case defensive position left field, and his worst-case either first base or designated hitter. Regardless, Knecht wasn’t considered a potential first round pick because of his defensive skills – he possesses an impressive power/speed combination in addition to his best tool, his bat. According to Perfect Game, Knecht runs a 6.54 60-time, which is exceptional straight-line speed. That speed has yet to turn into triples and stolen bases, but they could come as his baserunning skills improve. He has a smooth and easy swing to go along with a disciplined approach at the plate, giving the potential for above average to plus hit and power tools. He uses the entire field well, which allows him to be strong against both left handed and right handed pitchers. 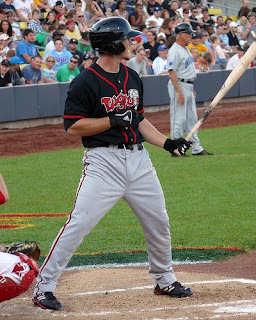 Playing alongside Jake Marisnick and Michael Crouse in the Lansing outfield, Knecht helped to drive the Lugnuts to the Midwest League championship, where they eventually fell in three games to the Quad City River Bandits. Fatigue may have been a factor late in the season for Knecht, as it was his first taste of full season ball in addition to the long playoff run. The statistics back up that assessment, as he hit .302/.391/.491 (.882) through the first four months of the season before falling off drastically in August and September. With the knowledge and experience gained from full season ball, Knecht should be better prepared for 2012 and ready to rake for five-plus months in Dunedin. The fourth player on the corner outfield primer is the list’s second Canadian, Michael Crouse. Unlike Knecht who was born in the home of the Blue Jays, Crouse is yet another product from the outstanding baseball programs of British Columbia, where current major leaguers Justin Morneau, Brett Lawrie, Jason Bay, Rich Harden, Ryan Dempster, and Jeff Francis (among others) all learned to play ball. Of the three corner outfielders who entered the draft, Crouse was the lowest selected as a 16th rounder in 2008. Crouse only turned 21 years old last month, but has already spent parts of four seasons in Toronto’s farm system -- though he has only started playing up to his potential in the last two. It shouldn’t really come as a surprise, however, as Crouse only recently became a one sport athlete. Throughout highschool, Crouse and his 6’4”, 215 lbs frame played a lot of football which, while greatly increasing his strength and athleticism, decreased the amount of time he spent in the cages learning the intricacies of the game. The growth is obvious, as his improvement with his bat has allowed both his power and speed tools to shine. In his last two seasons he has posted .859 and .827 OPS values respectively, while totalling 38 doubles, 10 triples, 20 home runs, and 52 stolen bases in 157 games. The only tool lacking is the bat, though it is more than playable. If he could continue to improve it to even fringe above average, he could me a monster in the power department. It’s very likely that Crouse and his two Lugnuts outfielder pals will be reunited again next season with the Dunedin Blue Jays, which should be a good challenge for the three, but Crouse in particular. 2011 was a weak year for pitching in the Midwest League, but the Florida State League will always have good pitchers and pitcher-friendly parks. If he continues his success from the past two seasons into the FSL, his breakout will be very real and he’ll start flying up prospect charts. Until that time, he still falls into the “prove it” category. For anyone reading this article or who reads my blog regularly, thank you, it means a lot, and have a Merry Christmas / Happy Holidays!